I called Mr Chimney to my home, because we had a smoke problem with our fireplace. There was a horrible smell. The guys came in and were really great! They recommended a thorough cleaning and they gave us an estimate for an Exhausto draft-inducing fan. After getting several estimates, we went with Mr Chimney because we got a few recommendations by neighbors and their price was really reasonable. The fan and cleaning really fixed our problem. We will definitely use their services yearly for cleanings. Mr Chimney was great! We needed a cleaning of our boiler and hot water heater flue. The chimney sweeps were so polite and kept everything very clean. I asked them to check my fireplace, as well. They performed an inspection of the whole chimney and said I was in good shape. Great prices too! Thanks guys! I bought an old Victorian house that is a fixer-upper. Mr Chimney and Phil McCrackin Masonry came in and inspected my chimney and gave me a full inspection. The chimney needed to be rebuilt from the bottom up, which my home inspector had said as well. I went with their company, because they have a great reputation and it was the most cost effective estimate I had gotten. Everything is great; going on a year! Thanks Mr Chimney. By the way, that picture of Phil is hysterical. Thanks for removing the Raccoon family from our chimney. The chimney rain cap is working out great! No more little visitors! Thanks for the great treatment neighbors! It’s very scary when your carbon monoxide detector goes off in the middle of the night. You guys were really there for us when we needed you. The men who came to our home were really clean and respectful. Our flue relining happened the next morning and we were good to go. Thanks for the chimney coloring books for the kids; they loved them! Been putting off creating my electronics store for several years, then I found Mr Chimney and about 30 minutes later ... I have an awesome looking electronics store. Totally love it – keep up the good work! Mr Chimney fixed our broken damper two days before Christmas. Thanks for fitting us into the schedule right away. Christmas wouldn’t have been the same with out our roaring fire. The custom glass doors in the living room look great and the wood burning fireplace insert you installed was exactly what we wanted in the office. Thanks for taking the time to show us all the catalogs, so that we could find the perfect one. The workers were on time, clean and showed me how to start a fire. They even helped me carry my wood in. Great people, great company! I had a really bad water leak in my home. I thought it was coming from my roof, but my neighbor thought it might be coming from my chimney. I called Mr Chimney/ Phil McCrackin in and they inspected the chimney and my flues. The technician told me I needed a new custom-built chase pan installed, a new rain cap, some repointing, waterproofing and a few bricks replaced. It sounded like a lot of work, so I asked them to explain all that it entailed. The technician sat with me, gave me brochures about the work I needed and showed me pictures of my chimney. I scheduled with them that day and the job was completed quicker than I expected. Keep me on your list for yearly cleanings. Thanks. Beautifully rebuilt firebox in my recently restored brownstone. Loving my fireplace in the coldest winter in a long time. I will be recommending you to all my friends. Thank you Mr Chimney! Our boiler wasn’t effectively heating the house and the costs were astronomical. We asked Mr Chimney to come in and install a wood burning stove for us. Turns out we also needed a boiler and hot water heater flue cleaning as well. Feels great on cold winter nights. We will be calling you for yearly chimney cleanings. Take care. I have 2 fireplaces in my home that were not working properly. One of the fireplaces had a blockage and smoke was coming back into the house. The other fireplace had a broken top damper. We had a chimney cap installed, tree branch debris removed from the flues and a new top damper installed. They also performed an inspection of our boiler flue as well, which needed a cleaning. The technicians worked really quickly to solve my problem and were able to come back the next day and complete the job. Thank you for your help and please use us as a reference anytime! Your logos are hilarious and we had such a great experience with Phil McCrackin and Mr Chimney. Thanks for helping us with our leak and the brickwork looks great! Can you call us and remind us to set up an appointment to clean the gutters in the springtime? Thank you. Thanks for the chimney sweep, really quick, clean and great price. Installation of our new chimney stack was quick and seamless. Thank you to the workers for keeping the building clean and being really courteous to all my tenants. I know it wasn’t easy organizing this, but you guys did a great job. Thank you. Thank you for the camera inspection. The insurance company is saying that the work will be covered from our chimney fire. We will be calling you in the next couple of months when we get the full approval. Talk to you soon and thanks for your thorough report. I saw the Phil McCrackin truck in my neighborhood and called you guys, because the picture on your van is priceless. Thanks for the help with repointing my firebox. Looks great. Glad I called. Thanks. Our fireplace cleaning and chimney cap installation was done quickly and professionally. Add us to your list for yearly cleanings please. Mr Chimney performed an air duct cleaning and inspected my chimney this winter. They ended up removing a bird’s nest and installing a chimney cap to keep it from happening again. We also got an estimate from Phil McCrackin to do some tuck pointing, but we are going to wait until this weather breaks to get the work done. Please give us a call to remind us. Thanks. Mr Chimney came highly recommended by our boiler company to give us an estimate for relining our boiler flue. We felt really comfortable working with them and they gave us a great deal. The guys were very careful during the installation not to get our new rugs dirty. They were also very helpful and explained their work step by step. They left two chimney coloring books for our kids as well. Great company. 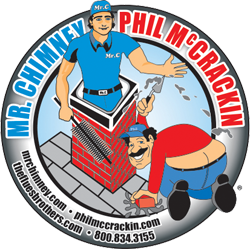 We called Phil McCrackin because we saw some cracks in the side of our house, between the chimney and the house. Our chimney also had weeds growing on it and there was some green substance starting to stain the side of the house by the chimney. The technician told us that our copper flashing was rusting and we would need to install new flashing. We also needed some masonry and brickwork as well. They also explained the chemical process they use to get rid of the weeds and vines growing on our chimney. They came highly recommended by a local fireman, so we decided to schedule the work and it was done in a matter of days. We are really happy with the work and will definitely call Phil and Mr Chimney again. Thank you. The dryer duct cleaning was just what I needed. You guys were great. Thanks for checking on it after you swept my wood burning stove flue. The dryer is working great now. Thanks for giving us a group rate that really fit our budget for all my neighbors to have their fireplace flues cleaned. You really inspected all the fireplace flues thoroughly and made us all feel more comfortable with using our fireplaces, safely, this winter. Some of the tenants needed chimney caps, new dampers installed, new bottom damper handles, new top damper chains and a little brick and repair work, which went off without a hitch. We had such a good experience with Mr Chimney and Phil McCrackin that we will be scheduling all the flues to be cleaned again, next fall. The fireplace custom glass doors you installed look amazing. Thank you for helping us select the best option, for baby proofing the fireplace and keeping our toddler safe. Thanks for the years of great service. It is always a pleasure and your workers are always on time. I really appreciate that the girls in your office take the time to confirm that the workers are coming, the night before. It’s so nice to know that this is a family owned business and I can count on you to be here when I need you as well. My turbine cap completely resolved my drafting problem and the flue is clean as a whistle. Thanks again. Mr Chimney and Phil McCrackin completely reconstructed my fireplace for aesthetic purposes. I really wanted the firebox to reflect the style of the rest of the house. The technician gave me many options for color and type of bricks and gave me ideas for the mantel as well. We went through catalogs for glass doors, as well, until I found just what I was looking for. The technician actually had the workers construct and install a new mantel for me. This project came out even better than I had envisioned it; thanks to the advice of your technician. Thank you for your hard work and patience in this process. The boiler flue relining solved my boiler problem. The boiler is not shutting off anymore and my boiler company says we are in great shape. Thank you for the speedy same day service and installation. It is a pleasure doing business with such an attentive and professional company. Thank you Mr Chimney.